Hockey. Homecoming. Holiday. Hartford. That about covers it. It’ll take more than season-crushing NHL lockout to spoil a family reunion. On Friday in Hartford, Conn., a joint puck-dropping operation prior to an American League Hockey game between the Connecticut Whale and the Providence Bruins featured a Navy father and his Air Force son, both home for the holidays and enjoying some minor-league ice time. Cmdr. Steve Wilkinson, a 30-plus-year Navy vet and skipper of the attack submarine Hartford, dropped the puck alongside Air Force 2nd Lt. Andrew Wilkinson, stationed with the 38th Cyberspace Command at Scott Air Force Base, Ill., according to a Navy release. 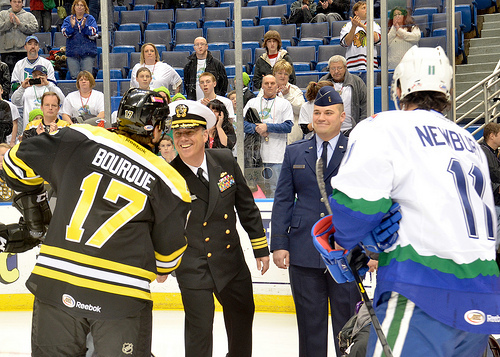 The ceremony was part of the Whale’s annual Military Appreciation Game. And as if hockey fans don’t have enough to be nostalgic about — “I remember when they used to play hockey,” etc. — the above photo should trigger memories throughout our New England contingent. On the left we have a Bruins jersey with Bourque on the back — that’s Chris, son of the legendary Ray, who’s hoping his AHL time in Providence will lead to another shot at the NHL (whenever that starts up). On the right is Kris Newbury of the Whale, whose uniform colors may strike a chord with Hartford Whalers fans. The Whale franchise dates back to the 1920s under several nicknames, but it’s been in place in Harford under its current banner only since 2010, carrying on some of the traditions of the Whalers, who left for North Carolina in 1997.